We are just over two hours away from kickoff in Ann Arbor, as Jim Harbaugh is set to make his head coaching debut in the Big House against the Oregon State Beavers. The Wolverines enter the game as a 14-point favorite over the Beavers, coming off a tough loss to Utah in Salt Lake City, while the Beavers are coming off of an unimpressive win over Weber State. The Beavers possess a solid run game, mostly from true freshman quarterback Seth Collins. Collins, a former two star prospect led the Beavers in rushing and passing against Weber State. Clearly, the Wolverine defense will be a much tougher opponent than WSU, Collins is likely to struggle heavily in front of what is guaranteed to be yet another crowd of 100,000+. 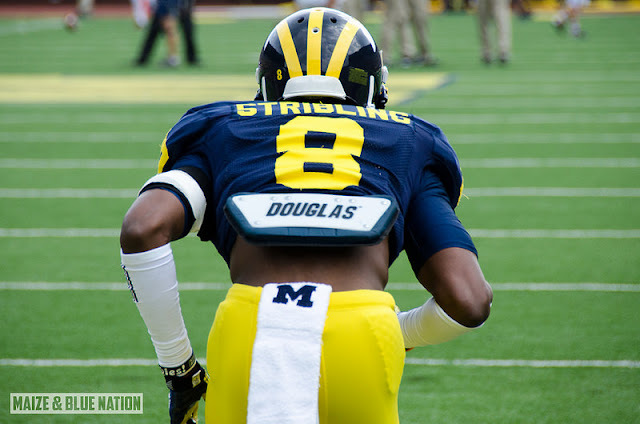 For Michigan offensively, things should look much better as compared to last week. Although the Beavers did not give up a defensive touchdown, the level of competition is night and day to what they faced last week. The offensive line should have no issues handling the Oregon State defensive front, which should give De'Veon Smith holes to run through, and Jake Rudock ample time to find an open receiver. Drake Johnson is expected to return today, and when healthy is the best running back on this roster. While Johnson is expected to be on a sort of a "pitch count" he can still make a solid impact. The Beaver defense did not give up a touchdown against Weber State, again, it was Weber State. The Wolverine defense will have a tough task in limiting Collins running ability, but the defense looked quite stout against the Utes. The biggest problem the Wolverine defense had was stopping the quick routes when the Utes offense went up tempo. With a scrambling quarterback at the helm the Beavers may go up tempo to throw the Wolverines off, but with the first game jitters out of the way, and a two star freshman quarterback running the show the Wolverines defense should have a field day. Prediction: Michigan 34, Oregon State 14.